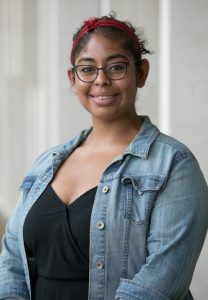 Jasmine Clark is a Resident Librarian at Temple University doing rotations in digital scholarship, library administration, metadata and digitization services. Her primary areas of research in the DSC are accessibility and metadata in emerging technology. Currently, she is co-leading The Virtual Blockson, a project to recreate the Charles L. Blockson Afro-American Collection in virtual reality, while also doing research in 3D metadata and the development of Section 508 compliant guidelines for virtual reality experiences.